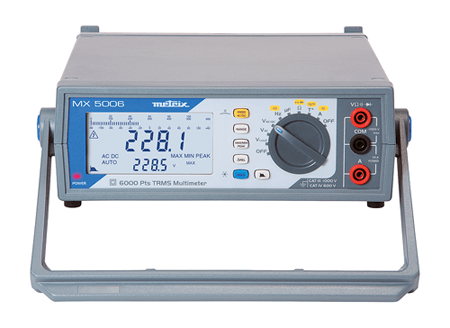 The simple and effective MX 5060 benchtop multimeter can be used for TRMS AC+DC measurements. The 60,000-count double transflective backlit LCD screen with bargraph and central zero offers instantaneous display of the signal variations. Designed for applications in 1,000 V CAT III areas, it benefits from additional safety for current measurement up to 10 A thanks to the single A terminal. For electrical engineering, a wide range of applications are possible, including measurements on household electrical appliances, power sockets, distribution switchboards, circuit-breakers, disconnectors, branch boxes, etc. 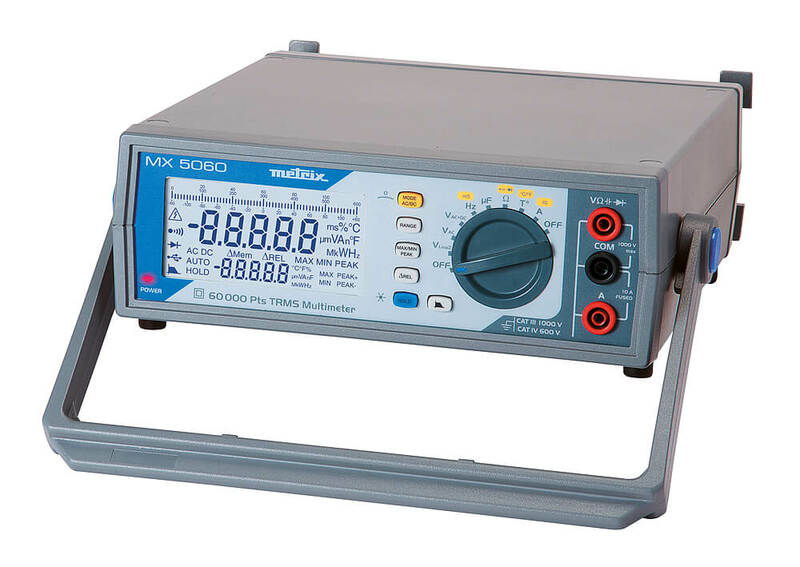 For electronics applications, the MX 5060 offers all the necessary functions: DC current, resistances, frequency, peak voltages, 60 mV calibre, bandwidth from VDC to 100 kHz. To ensure good measurement stability on variable speed drives, the MX 5060 is equipped with a 300 Hz PWM filter. Another feature provided to improve measurement stability is the VLowZ calibre for eliminating stray voltages.The function for monitoring the Min, Max and signed Peak values is accessible directly on the front panel of the MX 5060, as is the ∆REL function. For recording and processing measurements, the SX-DMM2 software can be installed on a PC to allow display and time/date-stamped recording of the values, as well as export into a spreadsheet.